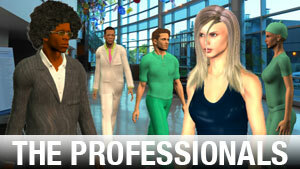 This StoryBoard Artist Add-On 3D rendered Character Library brings a cast of professional characters. Corporate Executive, Business Woman, Surgeon, Doctor and Registered Nurse at your service. They mean business! 6 poses, 4 elevations and 8 rotations for each action, including facial expressions!